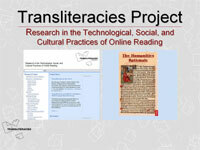 Transliteracies Project’s History of Reading Group holds workshop/colloquium. Presenters include Giles Bergel, Robin Chin, Lisa Gitelman, Mark Goble, James Kearney, Alan Liu, Paula McDowell, Joshua Neves, Carol Braun Pasternack, Clifford Siskin, Lisa Swanstrom, Alison Walker, William Warner. Interactive work calls into existence an I who makes things happen. It is not so much that digital modes exclude the physical body as that they require a constant negotiation of the relationship between the real and imaginal selves. Site content management system: WordPress. Design theme adapted/remediated from GuillaumeB's Tijù.